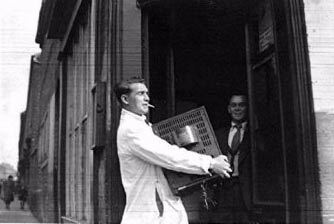 Now my chance to be the gaffer of my own shop at last, I knew a guy called George Docker who had a very good electrical shop in Park Road Aston near Victoria Road. He used to buy all the old televisions off us when I worked at Jolly's and I made sure he had some bargains so he owed me one. He also had an old junk shop on the corner of Upper Thomas Street and Tower Road that his wife was packing up, so knowing how devious George was I casually popped in to see him to buy a Morphy Richards iron 39/6:for my sister with a little discount. He asked me why I did not buy one off Jolly's so I said I was packing my job in and starting up on my own. "Bang he fell". He said 'Why not come in partner-ship with me. I have a little shop round the corner my wife is running". "We could buy it off her" I replied with a little white lie "I will, let you know as I am looking at another shop", you had to watch Sir Bernard. A few days later he was knocking at our door! Our mom said "Who is this crook" he laughed his head off, he was not all bad, he had a good sense of humour and our mom had him weighed up dead on as usual. She was a very good judge of people.Well after a bit of haggling we put £140 each into the kitty (my demos savings) and started off a little radio repair shop buying and selling all sorts of electrical gear at no 44 Upper Thomas Street. He left me do all the work while he ran his own shop selling me his stock at so called trade prices? It was hard going my first week I only took just fifteen shillings and the rent was 25 shillings luckily the landlady Mrs Batten who lived just up the street came for the rent each month, so I just slogged away taking on any jobs house wiring charging up accumulators and mending anything possible putting up radio & television loft aerials, door bells, you name it. I did it my hours 9 am till about 8 pm and Sunday mornings. What a rat race. Partner George was he must have thought all his Christmases had come together to get a mug like me working for nothing. For the first year I just about paid the overheads but I was learning all the tricks of trade watching him listening and the most important thing letting him underestimate me and keeping well in with all his contacts I creamed off the best. The first one was good old Frankie Griffiths the Woodman Stratford Road, Norman Rose Hurst Street. Ever ready man Billy Warrel, Mr. King with the boiling rings (9/-s) electric fires (14/6p) making them down his cold cellar in Vicarage Road Aston selling us loads of them cash no purchase tax. What a grafter no wonder he died so young with the tax men always on his back a good man. Carlo the television aerial maker who sadly did time because of the purchase tax rats, but when he came out he started up again in his wife's name. There were many more reps, all struggling to make a crust I do not think today's generation know what real hard work is no sir luckily for me I lived off my 100% war pension of 45 bob a week for a few months until they found out then they knocked it down to 60% well I had a good run. Now I was ready, one very quiet sunny day I said "George can you spare me a minute I am thinking of packing up" well his face dropped a mile, I said "I cannot keep on working for nothing my war pension has gone" another little white lie, then I made him an offer he could not refuse. How about if I buy you out' his face lit up ok he said "I want my £40, stake back and half the stock and kitty" so I settled up with him. His parting words were "You will not last long Stan but you can always come and work for me", he did not know the story of "the tortoise and the hare". I was still, in business when he passed on many years later much to his surprise he had a major chest operation in his fifty's and had a lung removed but sadly he did not last long after he could not pack up his cigarettes. I can see him now working away under a cloud of smoke coughing and barking away for years, silly sod he was a very clever engineer could put his hand to anything. It was well known after in the trade that I was the only one that had ever beat Sir Bernard at his own game it never bothered him he was a typical scorpion twister. He lived for work and loved wheeling and dealing. He did not how good a teacher he was to me, we never fell out. I owe George a lot good bye mate god bless. Up the street on the corner of Clifton road was a little electric shop owned by Mr Bott, a hard working electrician a nice guy. 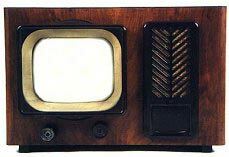 His name was Clem Jacobs, a bit of a harmless radio and television codger. They got a bit stroppy when I opened up but soon settled down ok. On the next corner was the chemist runs by Mr Saunders, I did quite a few jobs for him, a nice old guy. Most people went to him instead of the doctor's he used to make up is own medicines to cure all sorts of ills, he had the common loved by all. Old George used to call him Saunders of the River. Just up the street Eddie Fewtrell had a little shop selling his dads electric fires, but that did not last long much to quite, Mrs Batten my landlady lived over the road not a bad old stick when she got to know you, her brother Alec lived on his own at the back of the shop a nice guy. At the top of Upper Thomas Street was the Mayal dye works the boss Mr Mayal was a very good cash customer. He told me once he tried to buy some HP Sauce shares when they went on the stock market, he said they just opened and closed the book saying "Sorry all sold" "Crafty buggers" he said. On the corner of Victoria Road was Mr Horton's the builders, he gave us a lot of work wiring up houses ect, and his agent Mr Sprason good blokes paid cash on the nail. Just opposite the shop was Upper Thomas Street School; they won many prizes at swimming, well the baths where only just around the corner (Victoria Road public baths). One day some of the lads from the school were swanking around outside my shop windows and one of the lads fell through breaking it, of course they all ran away so I went up to the school to tell the headmaster about the damage, he assembled all the pupils in the main hall. He kept them there till the persons responsible for the damages to the shop, he made them say they was sorry, "Ok I said now how about making them pay for the damage". That shook him, I made them pay a few pennies a week, I never had any more trouble from them again. That is the trouble today they let sorry settle but five bob was a days takings in those days. The HP Sauce factory was on the next corner to me, I loved the beautiful aroma. I had quite a few customers from there including the gaffers, there was one a Mr Smith from Hendley in Arden who used to come to work in some very old vintage cars and park them outside my shop. His dad lived in Goldsleigh Road Sutton a grand house, I had dreams of living down there one day but they was very expensive. I had to repair an old television for him. 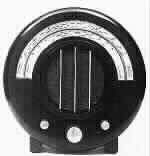 Another gaffer lived in Handsworth Wood I sold him a new quality Bush console radio, a real nice guy. I can remember one morning aloud thud coming from their works up in Tower Road, an old massive storage vat had burst and 45 thousand gallons of malt vinegar poured down Tower Road like a river, the poor old copper on point duty at Aston Cross was paddling in it, I bet that did not do his boots any good, cellars and some front rooms were flooded fountains of vinegar gushed out of plug holes of sinks and basins, three piece suits floated in parlours. The fire brigade worked hard all day pumping out the H P Sauce, the company had to pay out compensation "ok" but they were very surprised at the amount of people that owned mink coats and very expensive heirlooms destroyed by the flooding. Mind you I did stink for many weeks after. I can remember a copper passing my shop as the river came rushing down the street. He said "What's all that " I said "Vinegar" "Oh yes" he said as he jumped over it and off he scarpered. I bet he thought under his breath " I have heard it all now". This happened in January 1957 that vat must have been over fifty years old well HP started up in 1903 and they are still going strong. 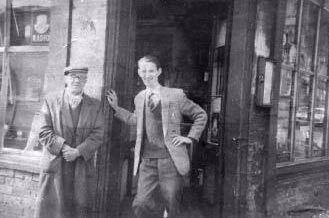 A good friend of mine Ted Winston and his family lived near the shop, he was a great help to me he got me plenty of good customers. Then there was Tommy Bubsby who worked at HP Sauce well he always seemed to be holding the gate open with his mates and taking a few bets a real cushy job I still see him around today, a nice guy. 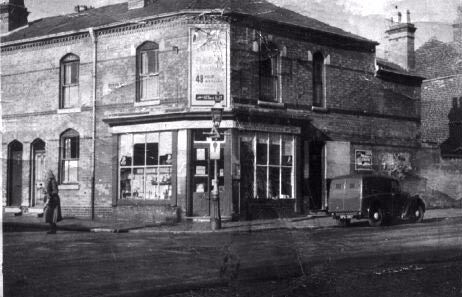 Just down Tower Road was Mrs Ganes a old saddlers shop, we had a job of wiring up their top floors she was a very nice lady well spoken and loaded she was a widow, she had a boy friend living with her. He once conned me into delivering some goods to their house in Welshpool in my old Austin 10cwt van. On the way we stopped to pick up some sand and cement, when we got there the house was up on the top of hill he said "You will have to put your foot down or you will never get up there" so off we roared and just about made it. What a day to top it all I picked up a puncture in the back tyre on the way back to Lozells Road. By the time I paid for that and the petrol I was on a loser, you live and learn. When they retired she offered me the premises to let 8/10p a week but it was to much for me, a polish guy Eddie the Yank took it on a real live crook but nice with it, he sold second hand death traps, crashed old bangers he welded up. He had his fingers in many pies once he was arrested. He married the police witness the case was dismissed he then dumped her after the honeymoon, clever chap I still see him to day. Next door was the Home and Colonial Store big Joe an Irish chap was their delivery driver, he did a lot of deliveries for me before I got a van nice chap still see him about he now works for the police. Aston Cross was a busy shopping centre in those days the Golden Cross was the main pub. In the sixties I rented a record player and records to a friend and he hired a room at this pub to run what we would call to day a disco, he lost money but he should have stuck it as he was on to a winner the very first disc jockey. Our bank was Barclays Aston Cross Mr Dunlop was the manager, a good guy he helped me to get a bridge loan on my house 53 Roslyn Road Walmley. We were selling when nobody would, I have stayed with them ever since. Another smart chap called Ralph Burnell from Robert Road Handsworth used to be a good customer, he called on little shops and gave them the patter and I supplied wired and fitted them with 4ft Merlin florescence light fittings. He was a crook and a born salesman he sold dozens, y have you come to see me" Steves dad said "My son told me you have a polish customer who you speak to". When I explained that my Mr Scannel was an Irish chap we all fell about laughing. Some smashing people lived around near the shop there was Ken Warren our part time electrician, we used to fly off to together on wiring jobs me clinging on like grim death on the back of his motorbike with all the tools and rolls of cable, I am sure he thought he was Tiger Hart the famous dirt track rider no crash helmets those days no sir we would have been taken for sissies, we made a few quid not a lot but we became good pals over the years, then he met his Miss Right Betty a very nice girl and what a lovely singer, One day as she was going past the shop to work we conned her to sing How Much is that Doggie in the Window the one with the waggerly tail in front of one of my customers who was a music teacher, he was very impressed but I bet Ken copped out later. They got married and had a daughter Debbie who is now married and as her own children she popped in to see one day. Always a smiler Ken and Betty are still ok. I will be sending them a copy of my reminisces at No 44 Upper Thomas Street 1952-67. His mom Mrs Warren used also to help us in the shop part time she loved meeting all our pals and contacts and she made a grand cup of tea or should I say gallons. Then on Saturdays she came in with a smashing cooked dinner and pudding for us, no wonder Ken was such big built bloke. His mom was a real grafter she worked at Edwin Lowes factory in Gerrard Street Aston. All her life from the age of 14 on a hand press but she had to leave later when they moved to Perry Barr as she could not stand waiting for three buses through another winter to get to work from were she now lived in Abbey Road Erdington, after having to move out of her home in Tower Road due to the new Aston Expressway clearance she was 79, they do not make them like that any more, I have kept a photograph of her leaving ceremony with the gaffers giving her a bouquet of flowers after 60 years of long service. She passed away 16 July 1979 age 80 god bless her. Another nice guy was our window cleaner Howard always smiling with is red hot tips on the gee gees still see him about, then old George Broadhurst of Clifton Road our debt collector he used some colourful language but they paid up just to get rid of him, a good old stick he used to take heart tablets just like Dolly Mixtures while sitting on the step in the sunshine we had some fun with old George, he passed away 1968 what a comic. Another good pal was Billy Warrell he had a radio and television shop in Bracebridge Street I did some good deals with Bill straight as a dye, but one day he sold a very cheap second hand television to a Len Kirby from 6 Theodore Street near Summer Lane, well the set went wonky so Len whizzed it back on his horse and cart to Bill demanding his money back or else he would throw the set through his window, brave Billy refused a big mistake it came crashing through the window, he said "now I am going to choke you if you don't give me my money back" Bill ran out to get a copper who "replied give him is money back he ain't killed you ye" well he knew the Kirby mob, poor old Bill it took him aged to get over it, he came round to warn me but I told him my girlfriend Sylvia lived up is entry and I knew Len he was always smart and well spoken but I would never have sold the Kirby gang any think no sir. Bill and I had many a laugh over it in his local corner coffee shop were our deals were made, Bill lived on to a ripe old age he retired to his caravan in Stourport with his wife went over to have a drink at his local one day a very nice guy. Fred loved his cars his favourite one a black Jaguar Mk1, he got married later to Maureen Vella a very nice girl they had three children and lived in Cheslyn Hayes unfortunately poor Fred developed Motor Neurone and passed away in the Cheshire Hospice November 1979, fortunately his wife and children were well looked after by Moe's mom Mrs Vella and her husband, John was a good friend of mine he came from Malta after the war , he had a small watch menders shop down Wheeler Street Lozells, a very clever man made a lot of money I got him a caravan near me in Holt Fleet he loved fishing, we had some great nights boy could he knock them back. He smoked like a trooper none stop loved a good booze up and a sing song I can hear him now with is gravel voice singing "I Left My Heart In San Francisco" in the Holt Fleet pub at four in the morning. The gaffer Jimmy Quinn loved our crowd, well we must have drunk him dry Johnny knew how to enjoy himself. I can see him now frying up big chunks of meat in his little shed smoke pouring out and singing his head off, he passed on his fifties heart attack but he enjoyed life to the full my kind of guy. 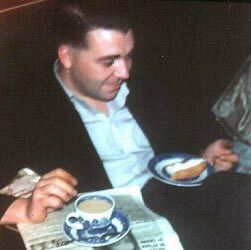 There was a wallpaper shop by John's run by a Mr Charlie Butler what a man worked life at the double worked his socks off a real jack the lad, we all had some great times with Charlie he could drink any body under the table very good natured, he did a lot of painting and decorating for me, always a good laugh. Later he took on a country pub near Kidderminster and just for a laugh he kept a goat tethered on the front lawn that he played with happily, Charlie was on the wrong side of the counter to make any money he passed on in his fifties a good man, another pal was old Harry Pridy of Upper Thomas Street another watch mender. He used to sell off our reconditioned televisions from his front room on commission, he did well he used to send 10% to his idol Billy Graham the evangelist. Now Harry was on his uppers and I used to scold him saying he was daft that a bloke lived in luxury, but it all fell on stony ground it made him happy. I used to pop in and have a cup of char with him every afternoon some times with rum in it that he got of a pal of mine, his milkman a young Black country Bob would join us on Friday bringing some cakes a nice good natured chap. I remember once Harry had some trouble with a television that came back he said I do not want that one back again he was quite upset but Fred mended it and we took it back any way, next day Harry blew is top he shouted "hey do you take me for a silly old coot" he was quite upset he said I marked it with a cross there take it back, so we did. Harry passed on one very hot summer 1968 he always looked forward to falling of his perch, he left Bob and me £25 each in his will the old coot god bless him. Another good customer was Barrington Ward a very posh bloke we soon straightened he was an editor on The Sutton Coldfield news paper his dad once owned it, it was on the corner of Ashford Road and St Stephens Street near Blew Street Park many years ago. Barry lived on his small farm near Hampton in Arden I sold him a nine inch Bush television set, Sylvia and I went there in 1958 to help him fix up his TV aerial on the chimney pot then we all had a nice little tea party in his garden he certainly was a busy chap looking after all his farm animals and working on the Sutton News, I once tried to sell him an old caravan I had at Holt Fleet but is wife was a bit to fussy she said in her posh voice " we will have to have a peruse around" a nice way of saying no, Barry was a good customer as long as it was a bargain nice guy. Another good mate was big Freddie Simpson from Park Lane near the Black Horse he used to drive a lorry moving empty rum barrels now that's were he got our cheap rum from Fred used to strain all the dregs off through a muslim rag into bottles a drop of good stuff he said it was one of the perks of the job, a nice happy friendly guy liked a tot a very good dancer. He once let me drive his lorry to fetch a load of second hand televisions from up the black country we had a smashing day out and I achieved my boy hood dream to drive a lorry out into the country one day. Down the road was park lane garage owned by two brothers Bill and Tony Bierd what a couple of happy go lucky lads they ran most of their business from the bar of the royal Albert pub in between backing all their dead certs and playing cards garage customers used to bang on the drain pipe and bill would shout 'ok help yourself' they were the very first for self service of course they ended up skint and unfortunately got involved with some knocked off gear Tony was a true Christian and took the rap for his older brother bill and did time in Winson green he told me Bill suffered with tuberculosis and prison would have killed him when Tony came out he took on roofing work with his mate Johnny Carter who I still see around they aqua sealed the shop roof for me ok but Tony had one arm in a sling he had come off a roof cutting his arm it was in a terrible state poisoned by the aqua seal what a grafter the brothers have both passed on now god bless them all. Another flash guy was Romeo Johnny Walker. He lived just down the road a good con man but he came unstuck in the end. A Miss Baggot a good customer of mine lived at the bottom of his entry and she used to direct his many jilted ex-girl friends up to his house he never found out who told them. An other wheeler dealer was Jack Turville a long distance BRS lorry driver lived at the back of the shop a useful bloke I still see him about then the Gavin brothers from Bartons Bank radio very dilapidated crammed with all sorts of old radios & televisions they worked upstairs looked like the place would fall down any minute happy lads. We were pals for years went to many auctions. We liked Slaters he used to say as he banged his hammer down "I shan't dwell". Two good honest guys. I still see Gavin about old George called them 'give and gave'. Another pal was Johnny Millward he opened a shop by the Alum rock pub did very well bought an old GPO van off me but he worked much too hard night and day he got into the wholesaling of fluorescent fitting shifting them about in bulk. He neglected his health for years and sadly he passed on in Dudley road hospital of peritonitis 211april 1964 only a young chap what a shame. Another pal was George homer a very good electrifications I used to pass on to him some wiring work if we were too busy once I passed on to him a job rewiring a flapper greyhound track for a friend of mine Southalls Scrap Metals Rocky Lane Aston. It was a big job but they could not pay him so he took a share in the track. He said the best days work he ever did, he never looked back through years of very hard work and good contacts. George ended up owning a beautiful mansion called Hatherton Hall in Cannock he invited my son Andrew and I over there one Sunday and he took us on a tour round it took hours very interesting then we had a nice tea party by the pool with his wife and children. He has retired now but he does a lot of good charity work a smashing guy. Now there was a strong rumor going round that a motor-way was going to cut through Aston. Well one sunny day 1966 old George was sitting on the step when he let out a shout "Stan there is a funny looking bloke with a beard out here with a flag an knees knocking studs in our footpath". I went out and George had grabbed the flag off him and was just about to tell him where to shove it so I made us all a nice, cup of tea. Well he was only doing his job. His name was Angus Wilson from Aberdeen Scotland. He lived at 1004 Pershore Road Edgbaston. We all became good friends he used to come to the shop on his bike and sell us his wife's home made cakes wine and Bantam eggs. A real Scot, he used to say he lived in dire poverty but I think he was loaded. He said all of Upper Thomas Street would be demolished soon starting July 1967 for the Aston Express way and he was right. Well all good things must come to an end so I looked round for another local shop April 66. There was an empty barbers shop up Tower Road 127 next door to George Davis our local street bookmaker so I took it on for 50 quid we cleared it all out and sold off the barbers gear to make a few bob extra the rent was about a 25 bob. I gave it a good run but it was a dead loss then in September I took on an empty butchers shop 132 Clifton road. I paid 100 quid to a Mr. Yates who was retiring the rent was about 30 bob but it had all the upstairs rooms and rear garages that I rented off one to Len barkers son who had a paper shop opposite. They were very good customers of mine. We cleared it all out and my brother Les who worked for Stanley's Refrigeration firm came with his mate to dismantle a cold room. What a struggle. I sold it later cheap to a mate then John our Dolls husband came and put me a new front glass in the window and I worked every night putting up shelves in all the bedrooms and kitted it out with a counter etcetera I had great plans to make it a vacuum cleaner centre for all type's, spares and repairs at that time I had the keys to four lock up shops going big time? But the best laid plans of mice and men aft gan astra (Robby Burns) fate stepped in and the estates sent some builders to do me some little repairs and they found that the gable end was unsafe we were next door to an old coal yard where coal had been piled up against it for donkeys years. They condemned the property and I had to get out but they found me a good little shop on the main Lichfield road 296 near Aston Station. Now we were going big time as my old pal Joe Bailey of Court Lane the king of the vacs said and we did but that is another story. If you would like to contact Stan, please email us and we would be pleased to put you in touch.